I have been reading John Calvin’s Institutes of the Christian Religion…for about a year. It’s an enormous, exhaustive work of theology. Ironically, Calvin laments that he has a love of brevity and is unable to expound on religious matters as thoroughly as his forebears. If Calvin hadn’t loved brevity, I shudder to think of how much longer Institutes would have been 🙂 Another terrifying thought is, What if Calvin blogged? LOL. In all seriousness, I have found much to value in Calvin’s Institutes. Calvin isn’t just a theologian living in abstractions. He is a pastor at heart. He doesn’t shy away from big theological ideas or mysteries; nor does he leave the Christian wondering how those big ideas relate to everyday life. Institutes is practical theology, first and foremost. “Total depravity” is an idea we often associate with Calvin. I have always heard this presented in a judgmental light, that people are evil through and through. I was surprised to find that this is a compassionate concept for Calvin. Depravity refers to the fact that our nature has been deeply affected by the fall. We are unable, in ourselves, to meet God’s expectations. By discussing depravity, Calvin is trying to release us from striving to fulfill moral and religious expectations that are beyond our power. The alternative is to recognize our state of need and to rely on the grace of God to fulfill what we cannot. Calvin was also a proponent of double predestination–the idea that God has already determined who will be saved and who will be condemned. This is, perhaps, one of the more controversial teachings in church history. It didn’t originate with Calvin but he is probably most known for it. 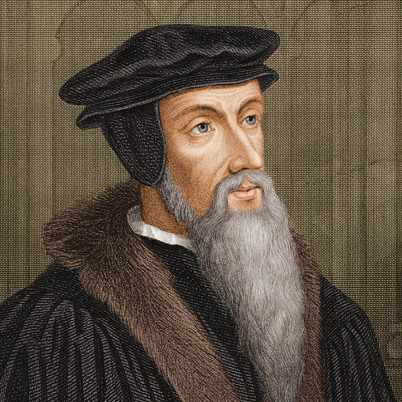 Here are Calvin’s own words on the subject: “By predestination we mean the eternal decree of God, by which he determined with himself whatever he wished to happen with regard to every man. All are not created on equal terms, but some are preordained to eternal life, others to eternal damnation.” Each of us receives salvation only because God chose to give it to us. Calvin maintains that we cannot truly walk in grace until we know this. If we do not embrace predestination, some part of our salvation lies with us–with our goodness, with our desire for God, with our will. For Calvin, this dilutes the purity of grace. As Paul says, “Now if by grace, then it is not by works; otherwise grace ceases to be grace” (Rom. 11:6). I plan to follow up this post with my own thoughts on predestination. But before I do, I want to hear from my readers. What do you think of Calvin’s quote? Do you think people are preordained to life or damnation? I do believe in predestination. But what makes it difficult to “swallow” is the concept of eternal, endless torment, without any possibility of relief. That’s truly too terrible to really even comprehend. I do NOT believe that “hell” is like that. God is God, and the clay can’t tell the potter what to do or criticize, so I shut my mouth when God speaks and let Him be true. However, I firmly believe God’s nature, and scripture itself, do not support the idea of nearly all of mankind being tortured in extreme pain for all eternity. Let me be sure I understand you. 1) You believe that, before time, God selected some people to be saved and some to be condemned? 2) You reject the idea that hell is a place of eternal, conscious torment? 3) What do you believe hell is? 4) What scriptures do you base your views of predestination and hell on? Thanks for clarifying for me! 1). I don’t claim to fully understand the issue of predestination, and I am more than willing to believe whatever may be revealed to me. I have vacillated on this issue for years, simply because it’s hard to wrap my head around. So I’m not dogmatic or terribly invested in one position or another. That said, I do seem to read a pre-determination of God in the scriptures regarding some who will be vessels of honor, and some of dishonor. 3.) Again, I don’t fully know. For example, Jesus spoke of “outer darkness,” and yet Revelation speaks of a lake of fire. Are they the same? If these are purely physical things, wouldn’t fire create light? Obviously, there’s more to it than a description of physical places. The natural mind always tries to make things physical and relatable, when God is spirit. I suppose just as much as scriptural support, I just have a “feeling” or “knowledge” that hell isn’t eternal torture. I am fully aware that feelings are often deceptive and wrong, but in this case it’s more than that. 1) Predestination involves a certain amount of mystery, for sure. If you haven’t read parts 2 and 3 of this post, I’d encourage you to. Basically, I submit that we’ve applied predestination to ourselves when it’s really speaking about Christ. In other words, rather than God choosing some to be in Christ and some not, God chose Christ. All who believe into Him are included in that choosing. 2) Not to label you but would you say you fall in the annihilationist category? I think it’s pretty well supported by scripture & don’t have any issues with people who believe that. 3) Agreed, we tend to physical-ize spiritual things. Whatever hell is, it’s ultimately bad, and God wants to spare us. 4) I haven’t had a chance to check out the links yet but will some time. Interesting account. I hadn’t heard that before. I pray the Lord was able to reach Voltaire in his final moments (like the thief crucified next to Jesus), and that mercy trumphed over judgment (James 2:13).